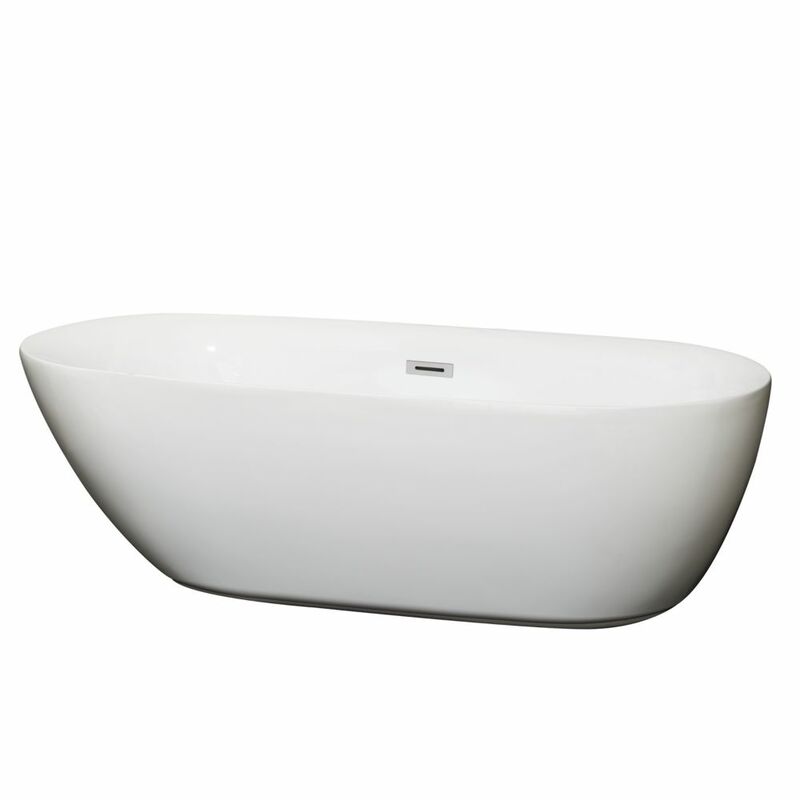 Soft rounded design meets full immersion soaking in the Melissa 5.92 ft. Centre Drain Soaking Tub in White. Light yet strong acrylic construction aids in ease of installation and is warmer to the touch than your average enamel or steel tubs. High flow drain allows for fast and convenient drainage. A deep soaking replacement for the standard 60 In. skirted bathtub with over 22 inches in depth from the deck of the tub to the floor, it allows bathers to fully submerge themselves for a more pleasurable bathing experience. The gently sloping back and arm rests are designed with comfort and ergonomics in mind, and the floor of the tub features a light texture. Constructed with an integral apron for easy alcove installation, this tub features a double tiling flange. The double tiling flange keeps tile, grout and silicone off of the deck of the bathtub and away from the water that may accumulate there during bathing. Overall it provides for a clean look and easy maintenance. The Elegance Plus is made from 100 percent acrylic with fibre-glass reinforcement for added strength and durability. As acrylic is non-porous, it is less vulnerable to mildew, soap scum, and staining. The bathtub comes with a set of preinstalled adjustable levelling legs to ensure that installation is a breeze. The Greek whirlpool features a space-saving design while its extra-deep bath basin permits a full soaking experience. A variable-speed pump with 18 settings powers four Flexjet whirlpool jets that provide an individually adjustable hydro-massage for those aching muscles, and an in-line, 1.5-kW heater keeps the water at your desired temperature. A white vinyl Repose bath pillow is included for extra comfort. Intended for drop-in installations, this model is constructed of durable, high-gloss acrylic, ensuring years of reliable use. Also available in store by special order only see store for details. Transform your bathroom into a spa-like retreat with the Agate 6 ft. Whirlpool Tub in White from Universal Tubs. The freestanding oval tub is equipped with eight fully adjustable and directional water jets to massage aching muscles and free your mind from worries. Powered by a 1 HP pump, the unit is safe to use with aromatic oils and bathing salts for extra-relaxing soaks. Fiberglass-reinforced acrylic construction features a nonporous high-gloss surface that's easy to clean and resists fading and staining. A slight side inset of the middle edge adds a sense of modern design, which will complement bath and sauna rooms of various settings and styles. Melissa 70.75-inch Acrylic Flatbottom Centre Drain Soaking Tub in White Soft rounded design meets full immersion soaking in the Melissa 5.92 ft. Centre Drain Soaking Tub in White. Light yet strong acrylic construction aids in ease of installation and is warmer to the touch than your average enamel or steel tubs. High flow drain allows for fast and convenient drainage. Melissa 70.75-inch Acrylic Flatbottom Centre Drain Soaking Tub in White is rated 5.0 out of 5 by 3. Rated 5 out of 5 by fatbottomedgirl from Beautiful tub! I looked at this tub at several places online and Homedepot had it the cheapest an... Beautiful tub! I looked at this tub at several places online and Homedepot had it the cheapest and getting it was much less hassle than the other places. It is just gorgeous!! and so very comfortable! Rated 5 out of 5 by Mare from This is a beautiful tub! It is long enough for my 6 foot husband to lay in and be comfortable. Th... This is a beautiful tub! It is long enough for my 6 foot husband to lay in and be comfortable. The slanted side it perfect for relaxing and soaking or watching tv. Installation was easy, being that we cut a hole in the ceiling below to securely attach the drain. It was light weight to get up the curved staircase but yet very nice quality. We have had it installed and have used it several times since installation, 3 weeks ago. I had researched many tubs while planning for this bathroom update. This really was a great tub for the price and size of the bath well. All reviews I have seen have been good, and that's what I purchased it on. Was not disappointed, and you won't be either! Rated 5 out of 5 by Sarahjeanea from Choose this tub! This bath tub has added the perfect touch to my renovations. It has a sleek style with a touch of elegance. It's shape is perfect and the comfort is unbeatable. The slope has the best angle for relaxation. It is a bit narrow width wise but the length along with the slope of the tub is a perfect fit for anyone to enjoy. The price is just right as well.